You know good oral health starts with proper oral care. Brushing and flossing along with regular visits to your dentist Weybridge, all go a long way to keep your mouth healthy. But, if youve ever experienced sore gums or a toothache, you know that dental problems can occur even when youre taking proper care of your teeth. In fact, besides pain, dental problems can cause you some anxiety, especially when you dont know exactly what type of issue you are experiencing. 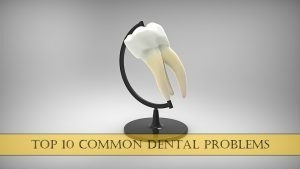 By educating yourself on the top 10 dental problems that most people experience, you can help prevent these issues or give yourself a starting point for a discussion with your dentist. Your dentist can treat a cavity with a filling, crown, root canal or even the removal of the tooth if the damage is extensive. Everyone may experience bad breath from time to time, but chronic bad breath, known as halitosis, is more than just a nuisance. In fact, for most people, bad breath is caused by a dental condition. If you suffer from halitosis, you may be experiencing gum disease, cavities, oral cancer,dry mouth or have an abundance of bacteriaon your tongue. You should seek out the care of your dentist when suffering from chronic bad breath. Gum disease, also known as periodontal disease, is an infection of the gums surrounding your teeth. If you believe you have gum disease, you should seek a dentist for help. Gum disease has been linked to heart disease and is the leading cause of tooth loss in adults, so early treatment is crucial. If you notice symptoms such as bad breath, red, swollen or tender gums, bleeding of your gums, teeth sensitivity or bad breath, your dentist may be able to help. If diagnosed early, oral (mouth) cancer may be curable for those who seek treatment early. If you notice symptoms such as sores, lumps, or rough areas in your mouth, a change in your bite, difficulty chewing or moving your tongue or jaw, you should seek help. Additionally, if you are a user of tobacco products and/oralcohol you should know these may increase your risk of developing oral cancer. While often annoying, most mouth sores or ulcers do not pose a serious problem to your dental health. Canker sores are a common problem that you may experience and only require treatment if they last longer than two weeks. If you have a tooth that experiences trauma, for example, a blow to the mouth, you may notice your tooth changes color. This happens for one of two reasons: your tooth is trying to protect the nerve, or the tooth is dying. In both cases, you should seek help from your dentist so that he/she can assess the situation and make a recommendation for treatment. An infected tooth nerve occurs when bacteria infect the root of your mouth. This may manifest itself as a simple toothache but is a much more serious issue. You may develop an abscess and excessive pain if not treated immediately. You may have had a loved one tell you that you grind your teeth during the night, although this is not the only time that you may grind your teeth. This grinding of the teeth is known as bruxism. Without treatment, your teeth may become worn down, or you may suffer from toothaches, earaches, headaches or jaw pain. There are several ways your dentist can fix a chipped tooth. He/she may smooth the tooth, provide a filling which matches your tooth color or use a veneer or crown. Chipped teeth should not be ignored as they may cause tooth pain or lead to further tooth damage if not treated. Your tooth enamel can experience erosion when it is bombarded with acid. The acid breaks down the tooth and can cause sensitivity to hot or cold items or even more severe problems. This condition is easily preventable. If you have questions about any of these 10 common dental problems, you should seek out the advice of your dentist. He/she can advise you on any issues you are suffering from and provide you with a proper treatment plan. Oatlands Dental Lounge is committed to making every patients visit as comfortable and personalized as possible. We consider our dental team, our patients and their families to be valuable elements - when you become part of the Oatlands Dental Lounge family, you become a very important person!